Our Sustainability Strategy & Reporting Executive Training in Dubai was a huge success! 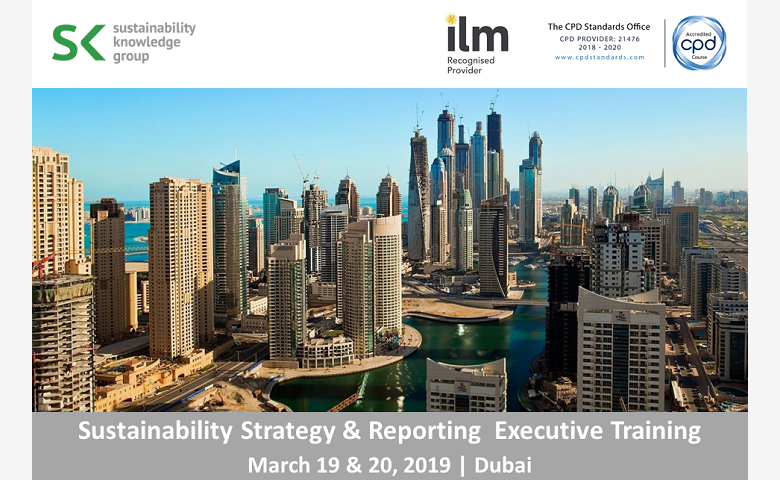 The Sustainability Strategy & Reporting Executive training that took place in Dubai on the 19th and 20th of March gathered a diverse group of participants from the USA, Indonesia, Oman, and Dubai. The participants, leaders in Sustainability, Communication, Quality, came from different sectors such as banking, hospitality, and FMCG. Through our interactive training, the participants gained practical knowledge on the most challenging part of Sustainability: implementation and creating a roadmap for Sustainability strategy. They gained skills to help them improve reporting on Sustainability performance and disclosing progress, apply current standards and frameworks, ensure they meet stakeholder requirements for a purposeful brand and align Sustainability and CSR with business priorities, targets and goals. According to our participants, the training was “Interactive, passionate, enlightening, deep”. Participants enjoyed the “flexible agenda” the “hands on experience” and the “related examples and experiences”. “The instructor provided excellent examples and tools to use for our organisation”. After the 2-day training program, our participants learned how to create a roadmap for Sustainability that will aid them and their organizations in navigating successfully all sustainability challenges. We are proud to see our participants full of confidence ready to take up the Sustainability agenda to the next level in their organizations and we are delighted to be a part of nurturing the new generation of Sustainability leaders.